Dr. Wolff graduated from Purdue University in 1965 and from Indiana University Medical School in 1969. He did his residency training in Orthopaedics at Charlotte Memorial Hospital in North Carolina. He served as a Christine M. Kleinert Hand Fellow in 1976. He is now past program director of the CMKI fellowship program and senior partner of Kleinert Kutz and Associates Hand Care Center. 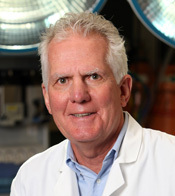 Dr. Wolff is currently an Associate Clinical Professor of Surgery (hand)(gratis) at the University of Louisville. He is a member of the American Society for Surgery of the Hand and a member of the American Academy of Orthopaedic Surgeons. Recent research interest has been in arthrodesis for osteoarthritis of the thumb CMC joint and a clinical study of the new treatment for resistant tennis elbow.